By using the Assign Wizard button, the user can assign leads and clients to the sales and customer service representatives of the organization. This tool was designed for the marketing and sales managers that responsible for assigning the clients and the leads to the organization representatives. By using this wizard, the user can easily assign the leads between the organization sales and customer service representatives. The Assign wizard button is available in the main Clients window, after displaying the searching results. In order to create the assign wizard, search for the required leads to assign. The user may use the search wizard in order to create and use required filters. After displaying the search results, press the Assign Wizard button. The chosen clients / leads will be presented in the "Assign Wizard" table. The user can choose and delete any of this table records. 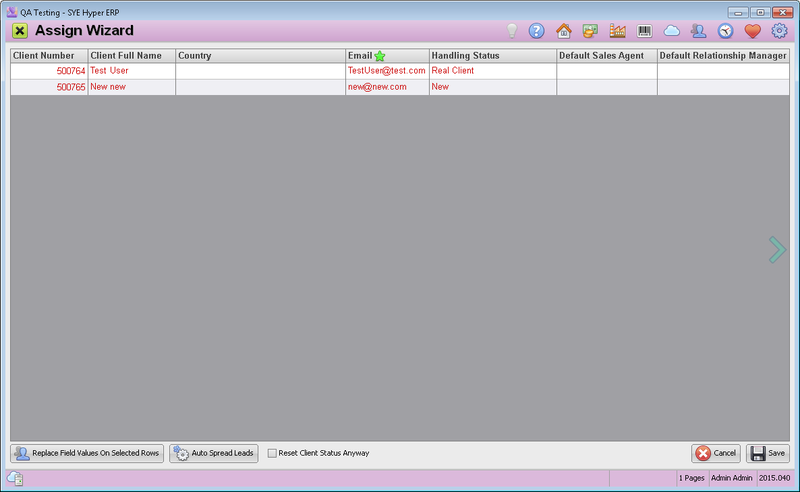 Please note - Deleting record from this table will not delete the Client / Lead. All of the leads in this table can be assigned by the representatives fields: Defaults Sales Agent, Default Relationship Manager, Spare Agent fields, that were defined in the client card. Please note - The system will not reset the fields of the "Relationship" tab. The user can manually assign each lead by choosing a representative from the list in the required representative field. Alternatively, it can be done for multiple leads by pressing the Replace Field values On Selected Rows button. In the "Replace Field Values On Selected Rows" window, choose the required field to modify and its new value (new representative). The user can choose multiple leads by using the Shift button or by dragging the mouse after clicking on one of the records. After modifying the representatives press the save buttons. At the top of this window, there are 3 fields to define the required representatives for the assigning: Field Name, Agency, Hyper Authorization. Press the Add Users to List Button. The chosen representatives will be added to the agents table. Representatives can also be added by adding rows to this table (using Ctrl+Enter) and choosing the representative from the "Select Users Dialog". Delete rows by using the right button of the mouse and choosing "Delete Selected Rows" or use the Clear button to delete all off the rows. When creating the list of agents, the system will automatically update the "Assignment Percent" field. The value of this field can be modified by the user as long as the total sum is 100%. Clear All Agent Names - by checking this check box, the previous representatives details will be cleared. Uncheck this check box in order to keep the existing representatives of the leads. After defining the required representatives for any lead, click the Continue button. The assign wizard will display a table with the clients and the assigned representatives. In order to approve the new assigning, click the Save button. The new assigned representatives will be updated in the client card. 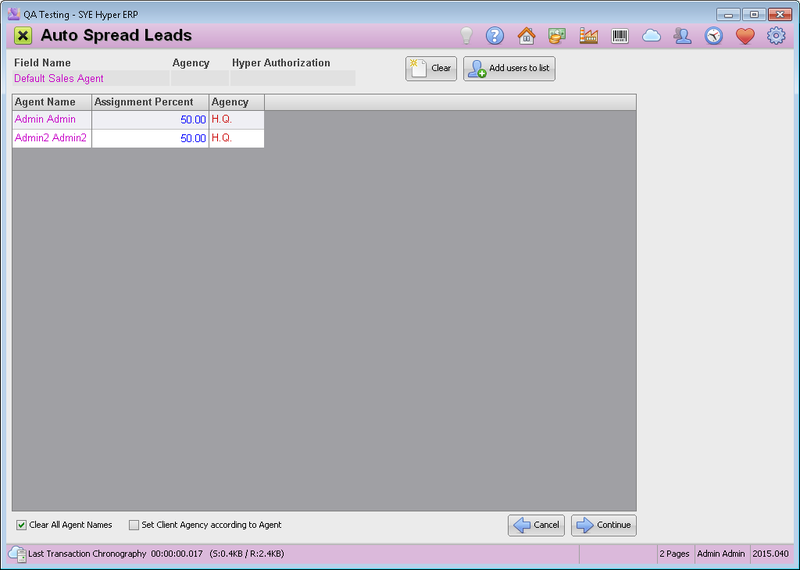 Set client agency according to agent - By checking this check box, the agency of the client / Lead will be defined according to the assigned representative.